Featuring an intricate resin spoke system, Bridgestone's new airless tire provides the same level of shock absorption as an inflated tire without you having to worry about monitoring air pressure or changing a flat ever again. 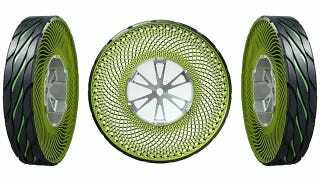 The idea is similar to Michelin's Tweel which first appeared back in 2006, and even the wheels used on the Lunar Rover that NASA developed during the Apollo era. But Bridgestone appears to have improved on both designs with the use of thermoplastic resin spokes that radiate out from the inner hub to the outer rim at a 45 degree angle. When combined with a second set of spokes on the opposite side that radiate out in the other direction, it results in added strength, stability, and flexibility.